It’s no secret that yoga retreats are becoming increasingly popular. But if you’re looking for one of the best destinations in the world to get away and go within, then you can’t go wrong with Costa Rica. Not only will you find beautiful yoga studios and natural wonders, but you’ll also discover the “Pura Vida Spirit” and a commitment to living a clean lifestyle. With early morning sunrises and early evening sunsets, fresh food all day long, yoga, surfing, and jungle excursions—the total experience of what sustainable living can look like is significantly enhanced during any visit to Costa Rica. A big part of the Costa Rican lifestyle is the excellent food that supports not only your physical health, but also nourishes the soul. The abundance of fresh fruits and vegetables throughout the country provides an authentic farm-to-table experience for anyone ready to embrace it. Not to mention, Costa Rica has an abundance of superfoods, or foods that are low in calories but high in nutrients, antioxidants, polyphenols, vitamins and minerals. Some even say these superfoods reduce the risk of chronic disease and cancer! Delicious in taste and spongy in texture, this superfood makes an awesome smoothie. Here in Costa Rica, Guanabana is often served fresh as juice, or frozen and then made into sorbet. Here are some more reasons to give in to Guanabana. 1. It has anti-bacterial compounds found to help fight off infection and keep you healthy. 2. It has been found to promote good sleep and to aid in relaxation. 3. It is excellent for relieving water retention since it is a natural diuretic. While not a large exporter, Costa Rica is becoming more and more popular for its natural homemade chocolate. 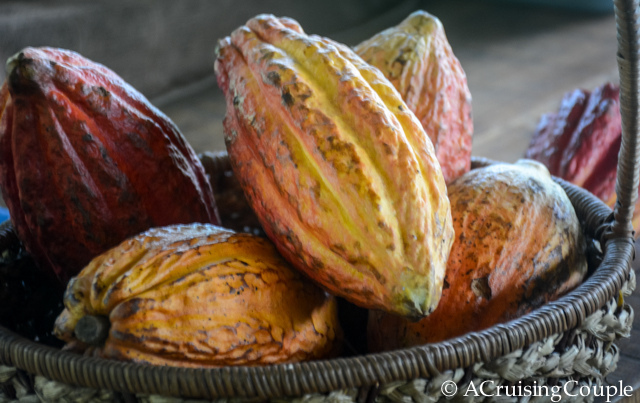 Here in Costa Rica, we like to simply call it Cacao. But let’s be clear. We are not talking about the chocolate bars you might buy at the 7-Eleven. We are talking about bars that contain 80 percent or more of raw cacao. Nowadays you can easily find how much cacao you are getting because it is stated on all chocolate wrappers, or at least those chocolates worth buying. Here in Costa Rica, it is not uncommon to find chocolate bars containing more than 90 percent, and even up to 97 percent cacao. Yes, those bars are 97 percent proof! 2. Cacao is full of magnesium that is not only important for a healthy heart, but crucial for a well functioning nervous system. 3. Cacao is a natural mood elevator and anti-depressant. No wonder why we feel so good when we eat it! Once known as the fruit of youth in Hawaii, Noni is also found in many areas of Costa Rica. It’s a stinky fruit and not all that pleasant to eat, but this superfood boasts a cure for whatever ails you. A secret Polynesian practice, Noni has been known to reverse the aging process and turn back time. But don’t take it from me–try it out for yourself! Traces of use for Noni date back 2000 to 3000 years ago in Southeast Asia, where the ancient medicine called Ayurveda (Sanskrit word meaning the science of life – sister science to Yoga) was practiced. Ayurvedic practitioners noted that this food was beneficial for longevity and in balancing the body. 1. Noni is chock full of antioxidants that may help to prevent certain diseases. 2. Noni is said to slow the aging process. 3. Noni is a natural food source loaded with vitamins and minerals. Costa Rica is filled with many mysteries. As a resident of Costa Rica, I am still amazed at the different kinds of super foods available. Often, I hear stories of the “older folks” in town who live well into their 90’s, living life with vigor and virility without the aid of modern medicine. I attribute their stamina and good health to clean living, and to the amazing super foods that are so readily available to them. Yogi Aaron, author of “Autobiography of a Naked Yogi”, brings passion and adventure to his teaching. Inspired, he guides students to secret and far-flung locales, empowers them to realize their own limitless potential, and makes yoga relevant and accessible for the modern world. Since 2002 he has been traveling and leading retreats worldwide and currently serves as the yoga director at Blue Osa Yoga Retreat + Spa in Costa Rica. www.blueosa.com Follow Yogi Aaron on Facebook.